CYBERJAYA: The master developer of Cyberjaya, Setia Haruman Sdn Bhd, is confident of selling RM500mil worth of land there this year amid the economic slowdown, said chief operating officer Lao Chok Keang. The company had also sold about RM500mil worth of land in Cyberjaya in the last three years, making land sale its largest source of income. Setia Haruman had paid more than RM1bil for over 2,800ha in Cyberjaya. The company is selling various categories of land in Cyberjaya, with commercial land for the building of offices and shops going for RM60 to RM65 per sq ft.
Commercial land for the building of hypermarkets, warehouses and shoplots is selling for RM90 to RM100 per sq ft. Residential land with ready infrastructure is going for between RM80 and RM125 per sq ft, while raw residential land is priced at RM30 per sq ft. Besides selling land, Setia Haruman is also working on its latest commercial development, CBD Perdana 2, set to be unveiled in the second quarter. Lao expects sales for CBD Perdana 2 to be good as many buyers of CBD Perdana 1 had managed to lease out their properties with an average 8% rental yield. “They have comfortable (profit) margins and a lot of them have enquired on when we are going to launch (CBD Perdana 2),” he said. CBD Perdana 2 is a RM210mil project comprising 32 retail outlets and 92 corporate office suites, and will be launched in two phases. The second phase will be launched next year. Office units at CBD Perdana 2 are selling for RM300 per sq ft and retail units for RM600 per sq ft.
Lao targets to achieve 100% sales for both phases. Setia Haruman is 75% owned by EMKAY Group while UEM Land Bhd holds the remaining 25%. PROPERTY developer SP Setia Bhd posted a 35.6 per cent lower net profit of RM31.2 million for the first quarter ended January 31 2009, due to slower property sales as a result of the global economic crisis. "Sales during the first quarter was very weak due to the extreme caution exercised by potential purchasers in the light of the unending flow of bad economic and financial news," the group said in a statement to Bursa Malaysia. SP Setia acknowledged that 2009 will be a challenging year for the company in view of the ongoing global financial turmoil, although it is in a strong financial position with RM572 million cash in hand. As part of its effort to drive sales, the property developer introduced the SP Setia 5/95 Home Loan Package, where buyers only pay 5 per cent upon signing the sales and purchase agreement and nothing more until completion. Since its launch on January 19, the group has made RM300 million in sales and is optimistic that the package will continue to spur sales during the three-month promotional period. Meanwhile, revenue for the first quarter dropped to RM259.9 million against RM303.7 million posted during the same period a year ago. The developer of a RM400 million heritage restoration project in Penang may sue the Penang Municipal Council and the state government, claiming that it's being prevented from continuing work. Kuala Lumpur-based Asian Global Business Sdn Bhd (AGB) also alleges the state authorities didn't tell of a height restriction affecting its project when planning permission was given in 2007. "We have been led up the garden path and were not told of a supposed height restriction of 18m for the area when they gave us planning permission in 2007 to build at 51.7m," AGB chairman Kate Lim told selected media at a briefing in Penang. "We are now considering legal redress because millions have been spent by us since no caveats were placed when approval was given. "We are now a victim of circumstances," she added. The "Pier Hub @ Weld Quay" project, located along the island's old waterfront, involves conserving six existing 19th century buildings and adding new residential and commercial properties, among others. It was slated for completion by 2011. AGB said the municipal council is not renewing their lapsed planning permission and is withholding the building plan. It submitted a renewal application last November and payment was acknowledged but the council has not responded in writing as to why an extension is still not granted. Last year, AGB and three other developers - Boustead Holdings Sdn Bhd, E&O Bhd and the Low Yat Group - came under the spotlight when their projects were singled out for allegedly breaching height restrictions. The rules were imposed by the United Nations Educational, Scientific and Cultural Organisation (Unesco) that placed George Town on its World Heritage List in July last year. The four projects were approved prior to George Town's entry into the list. They are AGB's "Pier Hub @ Weld Quay" and the Boustead Royale Bintang Hotel project behind the general post office in Lebuh Downing, both lying in the heritage core zone. The other two are E&O Hotel's extension and a 23-storey hotel in Jalan Sultan Ahmad Shah by the Low Yat Group in the buffer zone, both of which were reported to be 84.4m high. PETALING JAYA: The world’s biggest cement maker Lafarge SA is forecasting a contraction in demand for cement globally this year – the first in 25 years – due to the global financial crisis and economic slowdown. Chairman and chief executive officer Bruno Lafont expects cement consumption worldwide to drop by up to 3% this year as the economic slowdown takes a toll on construction and infrastructure activities globally. “However, to be conservative, we did not take much into account the economic stimulus packages that have been announced by various countries, not because they will not have an influence on cement demand as they all have an infrastructure component, but because we do not know when they will start to take effect. “So there could be upsides depending on the effectiveness of the implementation of the stimulus packages. It should have a positive material impact on demand this year,” he told StarBiz in an interview during his two-day visit to Malaysia to meet key stakeholders. According to Lafont, the global demand for cement has been growing at an average 5% annually for the past 25 years until 2007, with strong growth in emerging markets and more limited growth in developed countries. He said global cement demand had started to shrink last year mainly due to the economic slowdown in developed countries such as the United States, Britain and Spain. “Demand still grew to 2% last year boosted by good growth in most emerging markets,” he added. Lafont also foresees a slowdown in cement demand in the country this year. “We are not extremely optimistic this year but the stimulus package will help,” he said. The country’s cement demand grew 7% to about 17 million tonnes last year versus 2007. Lafarge’s Malaysian operations, Lafarge Malayan Cement Bhd, is one of the group’s largest business units globally and is the second largest in Asia, after China in terms of production. Lafarge Malayan Cement has a production capacity of 12.95 million tonnes of cement annually. To Lafont, Malaysia remains one of the 20 more important countries for the Lafarge group in terms of production capacity, profits, number of employees and so forth. Its other 19 important countries include France, Canada, Britain, Spain, US, India, China, Egypt, Algeria, South Korea and Nigeria. Lafont aims to turn the Malaysian operations into the best business unit of the group and best competitor in the Asian region. “To be the best competitor means having the lowest cost, highest quality and most innovative products among others and this is what we are working towards,” he said. 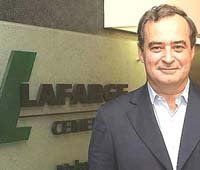 The Lafarge group, which has a presence in some 80 countries, recorded a 2.2% growth in operating profit to 3.36 billion euros for the year ended Dec 31, 2008 versus 2007 while revenue improved by 8% to 19.03 billion euros. DUBAI: Malaysian construction company, Bina Puri Holdings Bhd, is aggressively pursuing projects in the Middle East with the group bidding for about RM2 billion worth of potential projects in the United Arab Emirates (UAE). Its general manager of projects, Lee Seng Fong, said despite the global economic slowdown, prospects in the Middle East were still good although one must be more cautious when expanding in the region. “Currently we are present in Dubai, Abu Dhabi, Oman, Bahrain and Syria,” Lee told reporters during the Malaysia Services Exhibition 2009 which ended here yesterday. The group now has a total order book worth RM2.7 billion. Among its most prestigious projects are the three major highways in India, luxurious five-star hotel in Kathmandu, Nepal, the Malaysian Embassy and Ambassador’s Residence building in Beijing, China and an access road for the new Bangkok International Airport project in Bangkok, Thailand. Its signature projects in Malaysia include the Kota Kinabalu-Sulaman coastal road, two blocks of government buildings for Putrajaya Administration Centre, Putrajaya and the East West Road (Kupang-Gerik). He said government support is vital for Malaysian companies intending to venture overseas. “The Malaysia Services Exhibition in Dubai (MSE) spearheaded by the national trade promotion agency, Malaysia External Trade Development Corporation (Matrade) is timely as it shows that Malaysian construction companies are still present in this part of the Middle East region,” he said. The MSE Dubai from March 17-19, showcased Malaysia's services sector ranging from the various fields. The services sector is expected to drive economic growth within the Middle East and African nation. Bina Puri was one of the exhibitors at the event. Lee said there was a lot of interest shown for Bina Puri during the MSE 2009 with visitors from the Middle East expressing their interest in forming joint ventures with the company.